Mohamed Lekleti was born in Taza, Morocco, and lives and works in Montpellier, France. He graduated in Cinema from Montpellier University and obtained a Master in Fine Arts from Aix-en-Provence University. 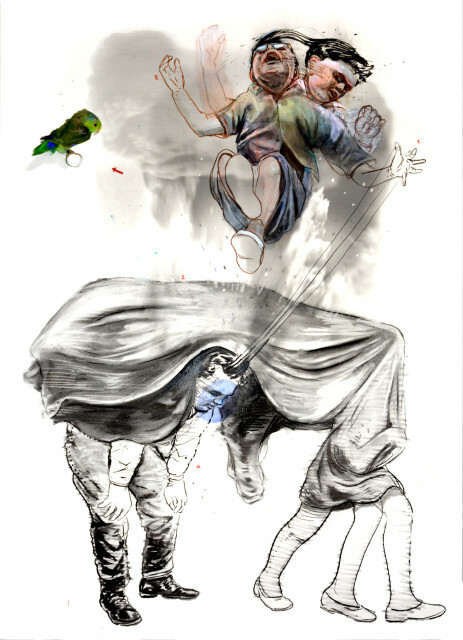 In 2011, he was the laureate of the Drawing Now contemporary art fair in Paris and within a few years became one of the emblematic artists for contemporary drawing in France and Morocco. In 2012, his works were exhibited at the Torino Palace of Fine Arts (INAC). In 2013, he created a project around the notion of borders, “Visa for a territory”, for the Forteresse de Salses, France (a National Heritage monument) and in 2016 he was selected for the Marrakech Biennale (Musée de La Palmeraie). Since then, he has taken part in many exhibitions: Museum of the Al Maghreb Bank, « L’Aspirateur » Art centre in Narbonne, Espace Dominique Bagouet in Montpellier with, as Curator, Michel Enrici (Art critic, Administrator of the Van Gogh Museum and ex-director of the Maeght Foundation), The Marrakech Museum of Art and Culture (MACMA). He regularly exhibits at French and international contemporary art fairs: Drawing Now, Art Paris, Slick, YIA, Art Elysées, Marrakech Art Fair, Brussels Art on Paper.